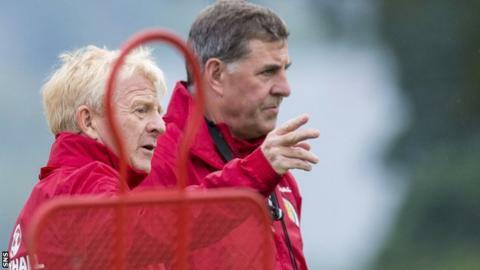 Scotland assistant manager Mark McGhee says he is keen to return to club management, but for now is focused on the final two Euro 2016 qualifiers with Poland and Gibraltar. Both the Motherwell and Dundee United managerial positions are currently vacant. McGhee though says he has yet to be approached by either club. "I'm not finished by any means as a football manager or a coach or as an a assistant manager at a club," he said. McGhee was Motherwell manager from 2007 to 2009, leading the club to third place in the Scottish Premier League. He then took over at Aberdeen where he had been a success as a player, but was sacked after just 17 wins from 62 matches. His last managerial appointment was at Bristol Rovers in 2012, but he lasted less than a year. "This is something I consider today, but not at the expense of compromising my position in this (Scottish FA) organisation," said Mcghee. "It's something I've had in mind forever. "This is the job I want to do at the moment and I certainly wouldn't do anything else that would compromise my ability to do that." Scotland coach Stuart McCall has admitted he would be interested in the Dundee United post, but says he will not return to Motherwell. McGhee, however, did not rule out a return to Fir Park. He said: "I've been complimented that a lot of people around me and a lot of people who have associations there have suggested that it would be a good thing for me and a good thing for them. "The people there know me and if someone was interested in talking to me I'm sure they would get in touch, but that hasn't been the case."